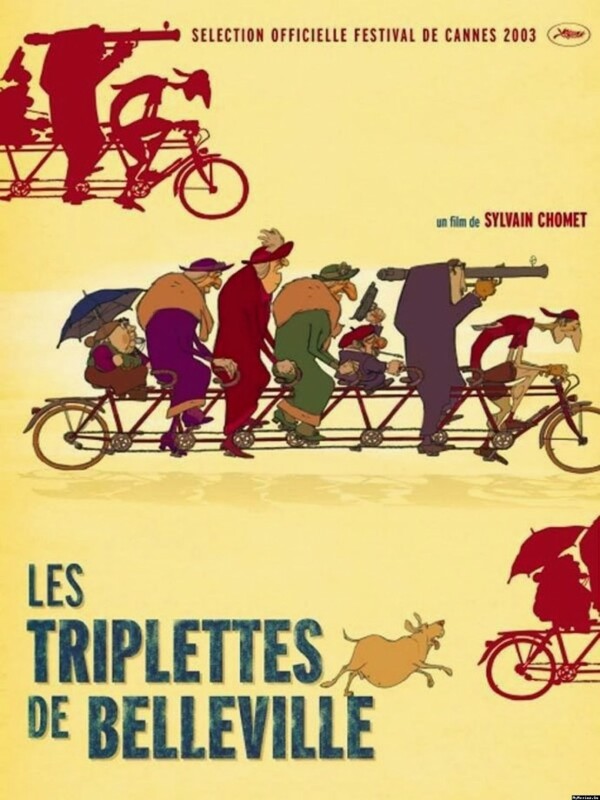 belleville rendezvous/bellville triplets/tri de bellevilles sa seomra tomorrow! After probably the most controversial Tour De France in history relax and enjoy this whimsical look at the Tour amongst other things. Not that it’s still without a fair share of skullduggery. A wonderful animated short â€” with the most addictive score of all time â€” covering themes as varied as friendship, a mother’s love, fat dogs and trains, the power of music and toasted frogs and ze mafia. Directions: Coming from Capel St bridge, turn left at the Boar’s Head off Capel Street, large grey-blue building on your right, old Melody Maker building. It is across the road from the “Capel Building” and Rhodes restaurant. It is on the Luas track. If you want to screen a feature/short/documentary/music video, e-mail screeninggroup@hushmail.com. 4 Mary’s Abbey, on the Luas tracks, grey door, opposite Rhodes restaurant. Whether you are a parent or just interested in kids, come along to talk about kids, different ways to practice parenting, organise childcare and relate to education. This is the initial meeting, with a hope to move forward into more regular get-togethers – weekly or monthly, possibly even longer-term projects around childcare/education. Bring the kids and toys/snacks to share. 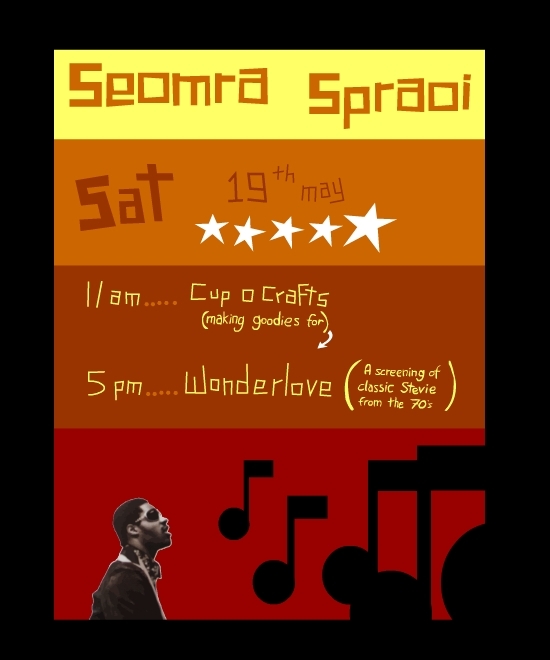 The Seomra Spraoi cafe is on from 2pm, so come earlier if you want a good meal! Notable themes of the film include youth culture, delinquency, social unrest and future uncertainty weighed against the historical spectre of nuclear destruction and Japan’s post-war economic revival. Akira (ã‚¢ã‚­ãƒ©, Akira?) is a 1988 Japanese animated film co-written and directed by Katsuhiro Otomo based on his manga of the same name. 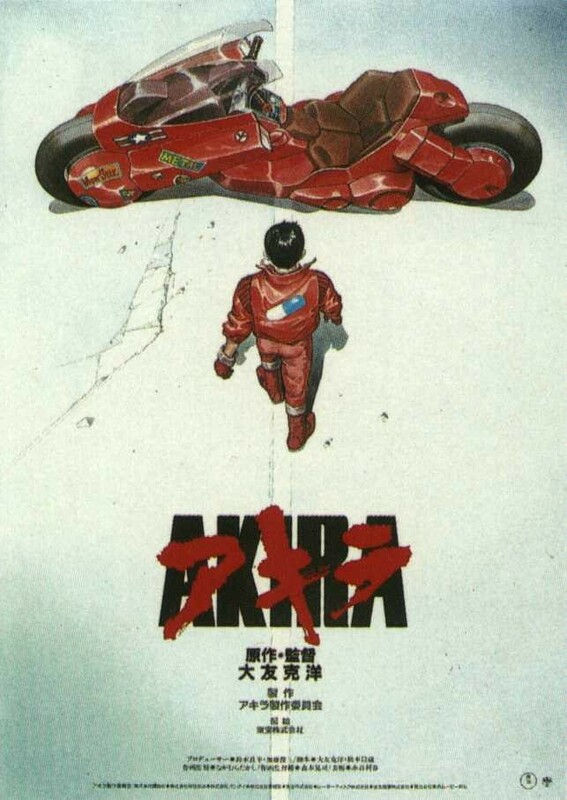 The movie led the way for the growing popularity of anime in the West, with Akira considered a forerunner of the second wave of anime fandom that began in the early 1990s. One of the reasons for the movie’s success was the highly advanced quality of its animation. At the time, most anime was notorious for cutting production corners with limited motion, such as having only the characters’ mouths move while their faces remained static. Akira broke from this trend with meticulously detailed scenes, exactingly lip-synched dialogue â€” a first for an anime production (voices were recorded before the animation was completed, rather than the opposite) â€” and super-fluid motion as realized in the film’s more than 160,000 animation cels. It is regarded by critics as one of the greatest animated films ever made. While most of the character designs and basic settings were directly adapted from the original 2,182 page manga epic, the restructured plot of the movie differs considerably from the print version, pruning much of the last half of the book. Coming from Capel St bridge, turn left at the Boar’s Head off Capel Street, large grey-blue building on your right, old Melody Maker building. It is across the road from the “Capel Building” and Rhodes restaurant. It is on the Luas track. This will be the second film screening in the new Seomra Spraoi (Dublin Social Centre) location. The aspiration is that there will be a D.I.Y weekly screening in Sproai Spraoi. 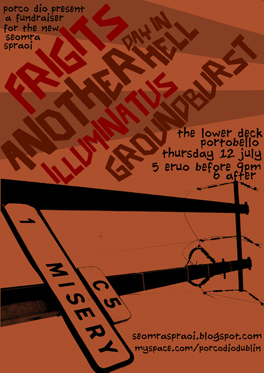 Our good friends Porco Dio are organising a seomra spraoi fundraiser gig on Thursday, July 12th in the Lower Deck, Portobello, Dublin 8. 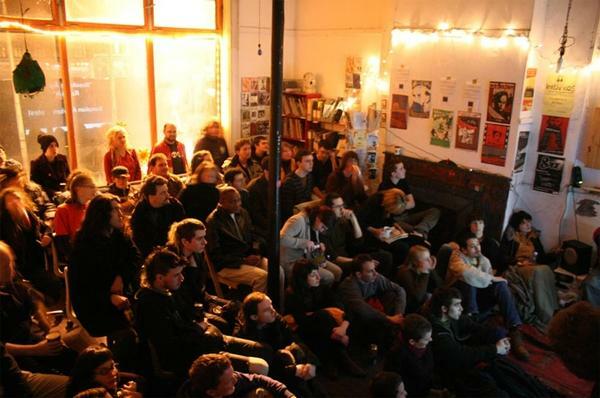 Film screening at Seomra Spraoi, every Wednesday evening at 7.30pm. Different types of films each week, all ideas welcome. If you’ve a film you’d like to show drop in and bring it along. Would be really great if people could get involved to help with organising each week. We have a really large screen, a good projector and a perfect big room. Donation at the door, no one turned away for lack of funds. There will be a party at Seomra Spraoi this Friday, July 6th. Put it in your diary now and more details to follow. 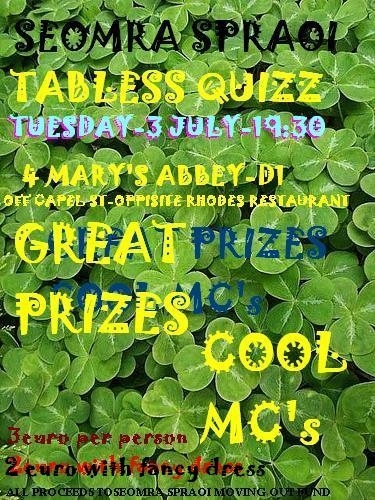 A tabless quiz will take place in our new HUGE premises. All sorts of questions, great fun and a chance to explore the new gaff. â‚¬3 per person or â‚¬2 if in fancy dress. All welcome. Directions: coming from Capel St bridge, turn left at the Boar’s Head off Capel St, large grey-blue building on your right, old Music Maker building. It is across the road from the “Capel Building” and Rhodes restaurant. It is on the Luas track. 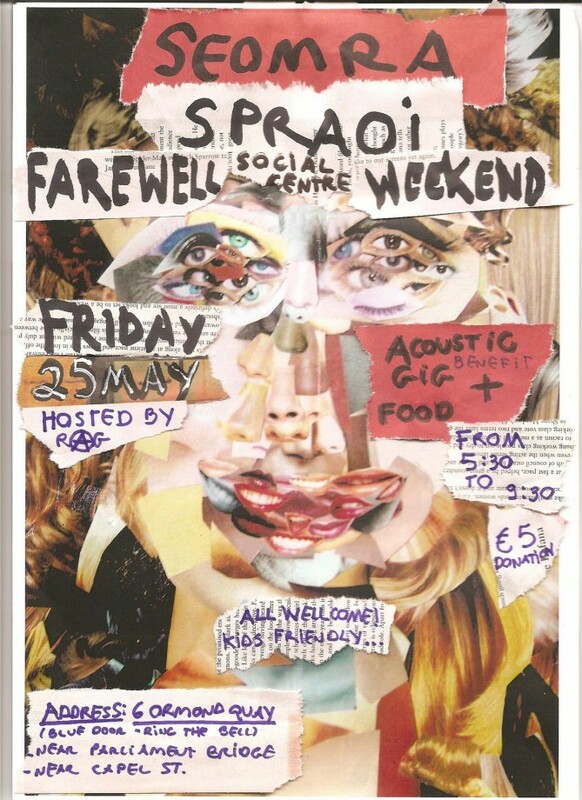 This is the final weekend for Seomra Spraoi at Ormond Quay. Tonight there is the usual weekly MEETING at 7.30pm, to discuss the weekend events, the clear-out and the future. Please come along! We are going to be paying a bigger rent very soon. Your help is needed. BRING YOUR BANK DETAILS along this weekend and fill out a standing order form. No amount is too small! Cuppocrafts, DIY make and do from 11pm to 1pm. This is followed by a fun papier mache workshop. This day of glorious activity is rounded off with a Stevie Wonder film at 5pmâ€¦ to mark this great man’s birthday of course! Every second Saturday come along for a morning of make and do. If you have a creative yearning then this is the place for you. Here is a temporary refuge to have some space to create and relax. Every second week there’ll be a project.You can bring your own project to work on and/or suggest one for a future Saturday.Tis up to you! You can start it there and then or bring your own to do.You can keep it for yourself or share it for another week’s project. Come along for a look, have a cuppa and a treat, make something, have a natter, be yourself. What’s in the pot is there to share: tea, materials, ideas, space and compassion. A cuppo refreshment, a cuppo relaxation, a cuppo creativity, a cuppocraft.